LIKE a mirage in the middle of Beirut’s high-rise seafront, the exquisite mansion is a lonely reminder of this city’s romantic past. As newly-built apartment blocks crowd in on its palm trees and delicate ochre-pink arches, it has become a symbol to Beirutis of the lightness and beauty their city seems to be losing. A rare survivor not just of the 15-year civil war that claimed so many of its historic mansions, but the building boom that came with peace from 1990, it is even said to haunt some of their dreams. The villa that once hosted French president Charles de Gaulle and American abstract artist John Ferren — a friend of Picasso — also inspired a film, Around the Pink House. Yet its fortunes declined over the years. But a chance visit by British painter Tom Young and his wife as they strolled along the seafront, together with the enthusiasm of a Lebanese property developer, has brought hope that the villa will be restored and revived. The couple found their way into the villa, where they met its tenant, Fayza al-Khazen. She told them that her brother Farid, himself a painter, had used it as a meeting place for other artists during Lebanon’s golden age of the 1960s and 1970s. When 71-year-old Fayza offered Young the chance to paint at La Maison Rose, as it’s known in the city’s francophone community, he jumped at the chance. But her lease was up at the end of the summer and Fayza had to leave. “I was quite concerned about what was going to happen to the building,” said Young. Fortunately, villa owner and real estate developer Hisham Jaroudi was happy to let Young exhibit his work there, and to open it to the public for a time. “This house will live on,” said Hisham, who bought Rose House several years ago. “It will be renovated and turned into a museum where Beirut’s history can be preserved,” he told AFP. Young can barely contain his excitement at being able to use the site as an art centre until the end of this year. “This place is like a fairytale!” he told AFP. Tiles and stained glass windows give colour to the villa’s interior. Black-and-white photographs of the Ardati family, who lived there in the early 20th century, and the works of now-deceased Farid Khazen, haunt the villa from across the years. “These places embody a culture and identity which must be preserved,” said Young, a 41-year-old from Northamptonshire who studied Islamic architecture in Istanbul. “Buildings like this are so unique to Lebanon; they are very important for its cultural identity. There is a wisdom about them which really needs to be protected,” he said as he sat on a balcony overlooking a lush garden. 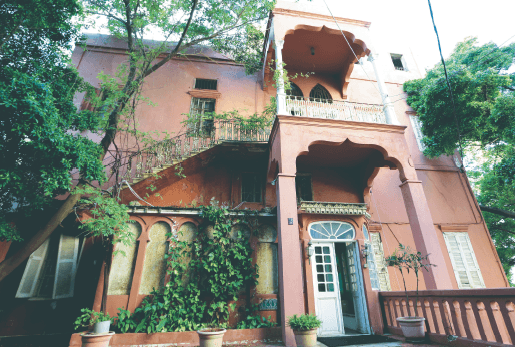 Activists have long lamented the disappearance of Beirut’s beautiful traditional homes. From 1995 to 2010, the number of traditional villas around downtown Beirut alone plummeted from 1,200 to 400. Young’s link with Lebanon dates back to 2006, when a Lebanese car mechanic in London commissioned him to paint scenes from home because “he missed it so much”. Since then, Young has been in love with the country. Its complex and painful history and civil war remind him of a tragedy in his own life, when he was only 10 years old. “My mother took her own life, and this has had a seminal effect on everything I have done since,” Young said. Now, he dreams of turning Beirut’s remaining old villas into art centres. “I try to use art as a way to save these places,” Young said. One of his paintings, entitled “Years”, shows piles of rubbish on a beach. To Young, it is “symbolic of the dysfunction of the state”. Another canvas shows Rose House being crushed by monstrous towers. “I think these wonderful places should be enjoyed by all people, of all classes, all ages and all religions,” said Young. During Young’s show, a video interview with Fayza delivers a message of hope for visitors.